From an early age I was only ever happy making things, but as a War baby, money and materials were scarce, so brown paper, sticky tape, and corn flake boxes were the order of the day. Looking back, my first lucky break was to be able to join the Salvation Army Young People’s band. I never knew what the notes were called, but I learnt which valves to press down. Another life changing experience was being able to go to the pictures, for two of the local cinemas had organs. While the other kids whistled and booed, I would move to the front and be totally fascinated by the organist’s dexterity. Just what did all those knobs do? One day I would not only know, but also be able to play a similar instrument myself. As a young school kid my only skill seemed to be that I was ‘good with scissors’. l now realise that I was the classic case of Dyslexia - which in those days just meant getting the cane a lot! At thirteen I made a crystal set, and life started to get a whole lot better. My first job as an apprentice radio engineer started me off on the electronics field that would keep me employed for the next 40 years. I was never able to work out all the formulas, but I seemed to have a gut feel for things, and earned a reputation for making things work. My lack of academic ability was a problem in getting qualifications, but - for example - when I needed to learn how TVs worked, my college tutor gave me an old 9 inch cathode ray tube, and I used it make my first TV. Not many other 17 year olds had a 9 inch device to tempt girls into their bedrooms! Whenever I applied for new jobs, I always had to lie when asked what my ambition was. Let’s face it! One can hardly admit that one’s prime aim is to retire as soon as possible, and do one’s own thing! I have always had a head full of ideas, and there are a number of useful new inventions that have appeared over the years which I can truthfully say that had already thought of! Fortunately, most of my jobs have given me the opportunity to have sufficient time to do a fair bit of personal design and construction at home. When health and safety went mad, my particular talents became redundant. You just do not get a certificate of worth for stuff you take out of a skip - and I certainly have no certificates for all the jobs I can do to a decent standard! Therefore, in 1993, at the age of 54, I realised my lifetime’s ambition and retired to concentrate on making some of the things I had in my head. Goodbye Crazy World - Hello Amateur Organ Building! And that folks is how it all began. The first thing I did after leaving work was to build a decent workshop. Previously I had only ever had a cold prefabricated concrete garage, with mainly hand tools, plus machines I had made from junk. On retirement, my new life really started - the one I think I was really born to have. 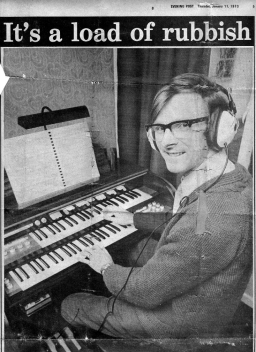 I experimented with all sorts of other organ stuff - one of my first constructions was a keyboard organ which used a vacuum cleaner as blower. It was for this organ that I made my first bass pipes out of hardboard! These were eventually put onto a shelf - only to be rediscovered years later, and used as the Bass helpers in Juliana, my 98 key MIDI organ. 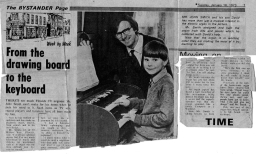 Back in 1995, my grandson, Daniel - then aged four - asked, "Could you make ME an organ, Grandad?" 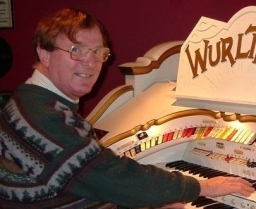 After considering this unusual request, I decided that the small 'Busker' organ that was used by street entertainers in Victorian times would probably fit the bill. I had already got ideas for a simple system and to make Daniel's “Toy” organ would give me good reason to build it. I came up with my own 20-pipe design, using a punched paper roll for the 'music'. It was built from 'bits and pieces' in my workshop, but using some novel techniques developed from experience gained with other organs. Grandson Daniel was delighted with the result, and was happy to show 'his' organ at rallies and other events. 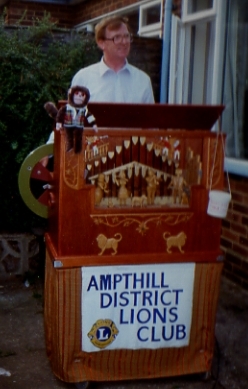 The result of this was that I began getting requests to make the plans available to others who wanted to build their own Busker organ - but I didn't have any! I had just worked out the design as I went along. However, as more people saw the instrument, pressure mounted on me, until I finally decided to build another - video the process - and make the video available along with instructions and some drawings. 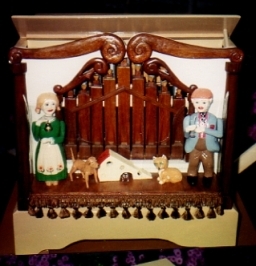 Because making the organ is uncomplicated and non-critical, not only woodworking hobbyists but others who had little experience of making anything were able to build their own organ using this package. 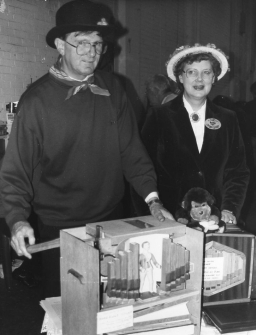 Buskers were built by housewives working on the kitchen table, people in retirement homes, and as school projects. When the package was eventually marketed through the Internet, it resulted in Busker organs being built by all manner of people, all over the world.